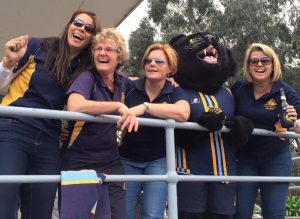 Mentone Hockey Club fields 3 teams in the HV Women’s Masters competition, one in +35 A grade and 2 in +35 B grade. The games are played on a Wednesday evening at our home ground in Keysborough (Mentone Grammar Playing Fields) and at the oppositions nominated ground. ‘Car pooling’ is part of the “game” for away games. The ‘B’ grade section is still a strong grade but caters for those coming back to the game, or taking up the game for the first time or looking for a more social experience. The 3 teams support each other when possible and we have a social dinner mid and end of the season altogether. If you are over 35, still passionate about your hockey and keen to play on a Wednesday evening then we will have a team for you.